2 B/R B/V home set on a spacious 8000m2 block. Master bedroom features bay window and large built in robe. Large second b/r with generous size built in robe. Neat modern kitchen with electric upright stove, condiments slide down cupboard, open kitchen and dining room area. Good sized lounge room with wood heating and reverse cycle air conditioning. Functional bathroom with bath, shower and vanity. Separate laundry with inside and outside access. Spacious entrance and hallway areas, functional carpet and blinds throughout the home. The home also features solar electric boosted hot water, a 9 panel solar panel system and NBN. Outside the home is surrounded by lovely lawn and garden areas, with fruit and citrus trees and a full sprinkler system. 2 megs of GMW unmetered channel water gives you ample water to fulfil all your water needs, along with 3 rainwater tanks, 2 concrete tanks, one is poly. Whole house is currently plumbed to rain water. The acre of land is divided into 2 paddocks with the additional benefit of access to a large drainage channel area. Lovely dam area, with willow trees. 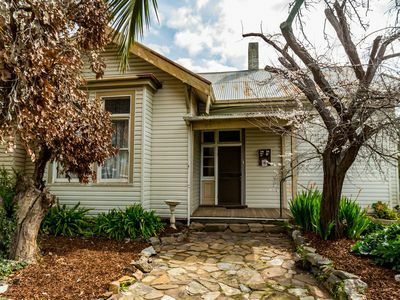 The property also features a chook house, excellent fencing, a double car shed with concrete floor, power and lights. 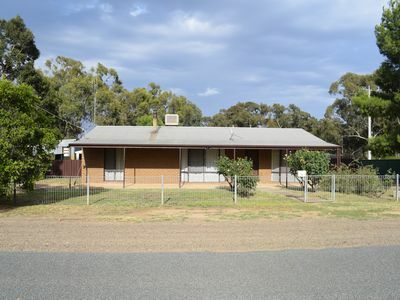 A lovely neat property with all the space and water you need to enjoy a rural lifestyle on a sealed bitumen road, with all the peace and quiet you could want in a rural property.